The air is getting chilly, evenings are getting longer and crispy fallen leaves cover the ground. Fall is here and Halloween is quickly approaching. What better way to celebrate than with a party? The first step of a successful Halloween party is setting the scene by decorating the party area. Hang spiderwebs or bats from the ceilings, and set black cats or skeletons in the corners. Lay ghoulish tablecloths over the tables and add decorative pumpkins or jack-o-lanterns. If the party is outside, add plastic tombstones around the area and hang ghosts in the trees. For DIY décor, cats, bats, and spiders can be cut out from black construction paper and ghosts can be made from spare sheets. Storing decorations in a Sterilite 18 Gallon Tote will protect them for years of use. The finishing touch is adding music. Eerie ambient music will set a spooky mood or a playlist of Halloween themed pop classics like the Monster Mash and Thriller will have the whole room dancing. During the party keep everyone entertained with some fun games. A storage tote can be used as a basin for bobbing for apples after the decorations have been removed. Fill the tote about three quarters full and float apples. There should be at least one or two apples for each player. You can start with all of the apples in the tote or you can keep a constant number and add apples as players remove them. Guests will need to remove apples from the tote without using their hands, and whoever retrieves an apple the fastest wins. Be sure to have towels on hand so that guests can dry off after they finish bobbing. If children are playing, select smaller and softer apples so that they are easier to bite and remove. Other fun Halloween games include witch hat ring toss – a ring toss where the target is a witch hat, or mummy wrap – split into teams and select a person to wrap up into a mummy with a roll of toilet paper. No party is complete without tasty refreshments. 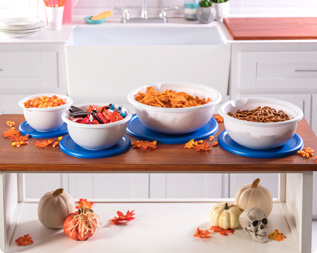 Lay out some chips and candy so that guests have something to snack on throughout the evening. The Sterilite 8 Piece Covered Bowl Set is great for serving snacks because it has four different sizes and includes covers for storing leftovers. A spooky bowl of deep red punch will make guests feel otherworldly. Below is a recipe for a delicious red punch. 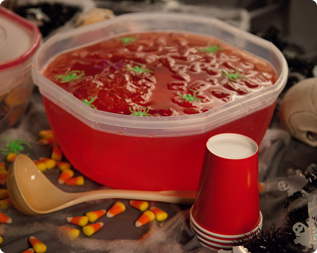 To save time on the day of the party you can prepare the punch in advance and store it. The Sterilite Ultra•Seal™ 8.1 Quart Bowl has an airtight and watertight seal so it is perfect for storing and transporting punch. When it is time to serve the punch, simply remove the lid. For extra creepy punch, garnish with plastic spiders, or for an edible fright, use gummy worms. In a large punch bowl, combine 2 quarts of the cranberry raspberry juice, orange juice, pineapple juice and seltzer water. Add sugar if you want a super sweet punch and mix until dissolved. Your guests will be eagerly awaiting your next gathering after you throw an awesome party with these tips. 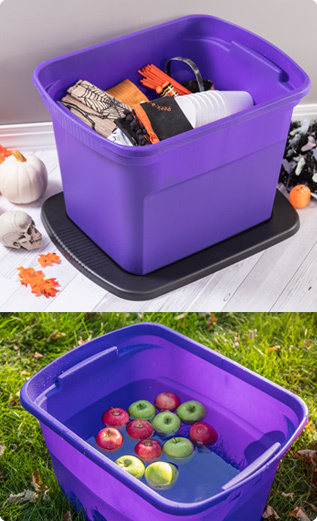 The Sterilite 18 Gallon Tote doubles as storage for your decorations and a basin for bobbing for apples. Lay out snacks for your guests to munch on throughout the night. The Sterilite Ultra•Seal™ 8.1 Quart Bowl is perfect for both storing and serving punch. Don't Let Back to School Get the Best of You! A Fresh Start to Spring! Holiday Hacks: Undeck the Halls!